WNBA champ and Minnesota Lynx guard Maya Moore understands the importance of having a good coach. She’s been fortunate enough to have had strong coaches and knows that some go beyond the call of duty by investing in the lives of athletes. To reward coaches displaying a high level of support and development, she signed on as judge for U.S. Cellular’s Most Valuable Coach program. The Most Valuable Coach program is in its third year. It honors K-12 school-affiliated sports coaches who connect to the good in students and inspire their players through leadership in their schools and communities. The public voting process began on Sept. 18 and will run through Oct. 8 on TheMostValuableCoach.com. Moore will join Green Bay Packers wide receiver Randall Cobb as a judge. The two will be on a panel that will take the top 15 vote-getters and narrow them down to the three finalists. The top three coaches will receive donations of $50,000, $20,000 and $10,000 to help their schools. The first-place coach will also receive a Samsung tech package valued at $30,000 for their school. Moore is inspired by her own coach, Cheryl Reeve. “She is somebody that embodies a coach that motivates players,” Moore said. “Somebody that is passionate about her community and is really talented at the X’s and O’s and knowing the game and skill development, so I’m hoping some of the coaches that we’re going to vote for will be able to have the same characteristics as my own coach with the Minnesota Lynx. 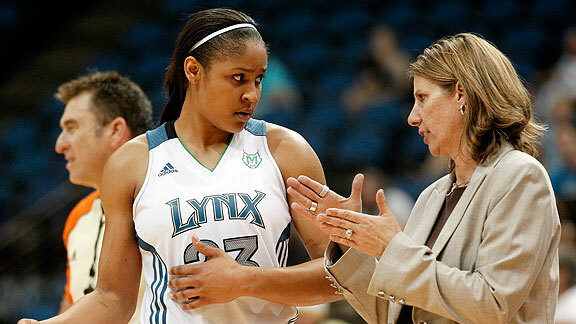 Minnesota Lynx forward Maya Moore (left) talks with Lynx head coach Cheryl Reeve during a game against the Tulsa Shock in Minneapolis. “One of the things that I’ll be looking at as a judge is coaches who are able to impart how to handle success and failure into their players. You can keep in mind what coaches are out there inspiring their players in success and in defeat. That’s very important as a coach, to be able to teach the players how to deal with both.